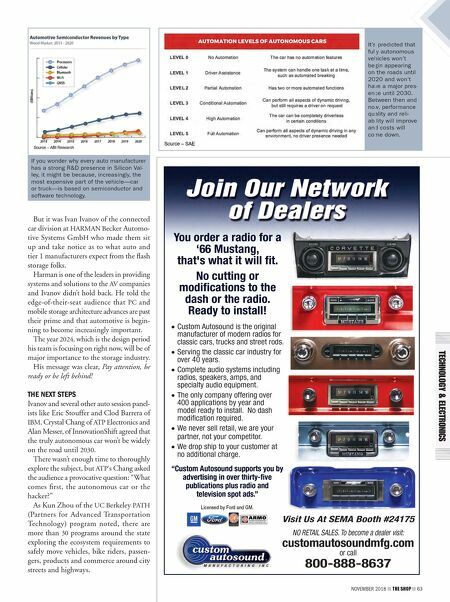 62 THE SHOP NOVEMBER 2018 While more autonomy is promised in the next couple of years, it's going to take time and a whole lot of consumer education. Take the man in England earlier this year who thought it would be cool to put his Tesla on autopilot. He slipped into the passenger seat and let the electric car whiz along at 40 mph. He lost his license for 18 months. One of the best features normal folks are looking for is the introduction of sophisticated crash-avoidance systems— computers, cameras, radar, lidar, sensors... the works. All those systems will be sucking in data from every corner of the car, including checking to see if you're awake, having a snack, sending/reading texts, picking your nose, everything. No wonder the flash folks sat up and listened when Greg Basich, senior analyst of global automotive practice at Strategy Analytics, gave his opening comments during the first auto session at FMS. All that data has to be kept somewhere, and the best way to store it—even for a nanosecond—is on some type of flash media. Of course, the NAND folks believed the best storage for all the auto data is on their technology. NOR folks said nope, it's theirs. RAM folks put in their bid. SSD folks scoffed and said they would rise to the top. Mando, a global auto parts manufacturer of the Halla Group, announced in August that it acquired an autonomous vehicle testing permit in California. 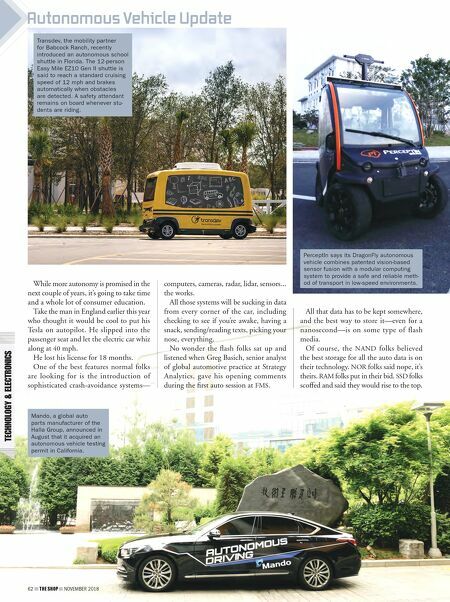 62 THE SHOP NOVEMBER 2018 Transdev, the mobility partner for Babcock Ranch, recently introduced an autonomous school shuttle in Florida. The 12-person Easy Mile EZ10 Gen II shuttle is said to reach a standard cruising speed of 12 mph and brakes automatically when obstacles are detected. A safety attendant remains on board whenever stu- dents are riding. Autonomous Vehicle Update PerceptIn says its DragonFly autonomous vehicle combines patented vision-based sensor fusion with a modular computing system to provide a safe and reliable meth- od of transport in low-speed environments.